Distribution and habitat: Psidium guajava is an evergreen shrub or small tree native to Mexico, the Caribbean and Central and South America. Psidium guajava is grown successfully in tropical and subtropical regions up to 1500m (5000 feet) above sea-level. It was adopted as a crop in Asia and Africa. Now it occurs throughout the Pacific islands. Generally, it is a home fruit tree or planted in small groves, except in India where it is a major commercial resource. It is cultivated in gardens but often it was escaped and naturalized where introduced. 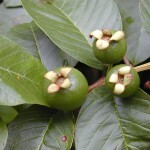 In some tropical areas, Psidium guajava can become invasive and it is a major problem in the Galápagos Islands, Hawaii, New Zealand and southern Africa. 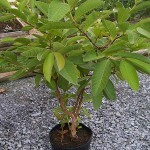 Description: Psidium guajava, is a large evergreen to 10m (33 feet) with spreading branches. 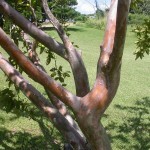 It is easy to recognize because of its smooth, thin, copper-coloured bark that flakes off, showing the greenish layer beneath. Also because of the attractive, “bony” aspect of its trunk which may in time attain a diameter of 25cm (10 inch). Young twigs are quadrangular and downy. The leaves, aromatic when crushed, are opposite with short-petiole, oval or oblong-elliptic, somewhat irregular in outline; 7 to 15cm (3 to 6 inch) long, 3-5cm (1-2 inch) wide, leathery, with conspicuous parallel veins and more or less downy on the underside. 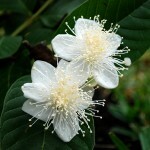 Faintly fragrant, the white flowers, borne singly or in small clusters in the leaf axils, are 2.5cm (1 inch) wide, with 4 or 5 white petals which are quickly shed and a prominent tuft of perhaps 250 white stamens tipped with pale-yellow anthers. The fruit, exuding a strong, sweet, musky odour when ripe, may be round, ovoid or pear-shaped, 5 to 10cm (2-4 inch) long, with 4 or 5 protruding floral remnants (sepals) at the apex; and thin, light-yellow skin, frequently blushed with pink. Next to the skin is a layer of somewhat granular flesh, 3 to 12.5mm (1/8-1/2 inch) thick, white, yellowish, light- or dark-pink or near-red, juicy, acid, subacid, or sweet and flavourful. The central pulp, slightly darker in tone, is juicy and normally filled with very hard, yellowish seeds, 3mm (1/8 inch) long, though some rare types have soft, chewable seeds. Actual seed counts have ranged from 112 to 535 but some guava are seedless or nearly so. 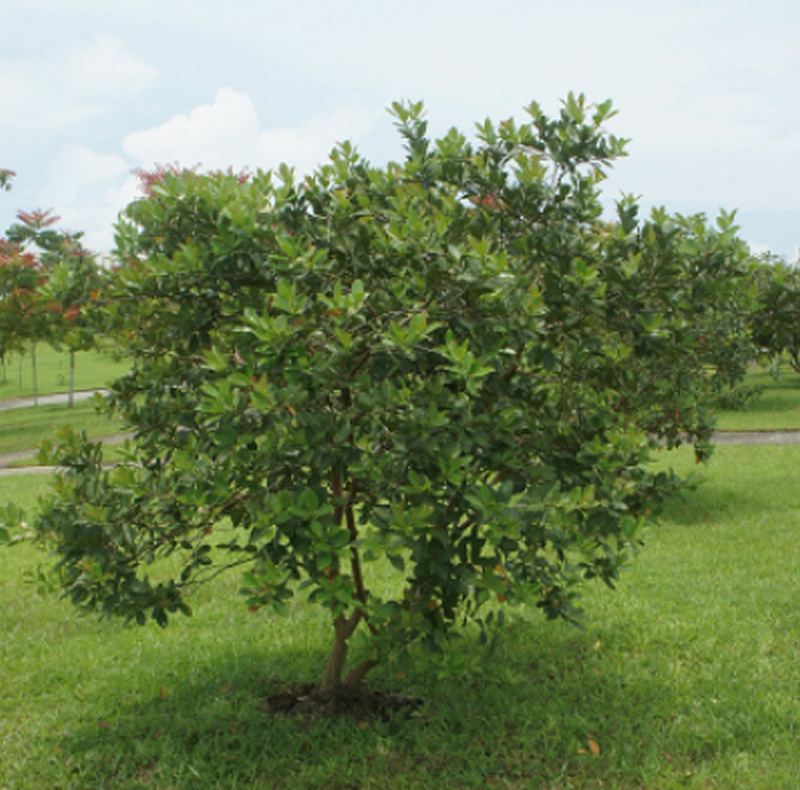 Gardening: When cultivated from seed, Psidium guajava trees are notable for an extremely slow growth rate for several months, before a very rapid acceleration in growth rate takes over. From seed, Psidium guajava may bloom and set fruit in as few as 2 years or as many as 8 years. Highly adaptable, Psidium guajava can be easily grown as container plants in temperate regions, though their ability to bloom and set fruit is somewhat less predictable. The Psidium guajava is said to produce more fruit in areas that have a distinct winter season, compared to tropical areas. Psidium guajava tree survives well the competition of weeds, grass and brush. Growth is benefited by root association with arbuscular mycorrhizal fungi. This thin-barked species is easily top-killed by fire and is sensitive to frost. Hard pruning can be employed to keep the fruit low enough to be easily harvested. Location: Plant Psidium guajava in full sun. It grows well over a wide climatic range. It thrives in both humid and dry climates. Protect these plants in frost prone areas. Optimum distance between the trees should be at least 10m (33 feet). Planting 5m (16 feet) apart is possible if the trees are “hedged”. The species is moderately intolerant of shade. It develops a broad, low crown if open grown, grows a more vertical crown with side shade and becomes tall and spindly in intermediate shade positions. 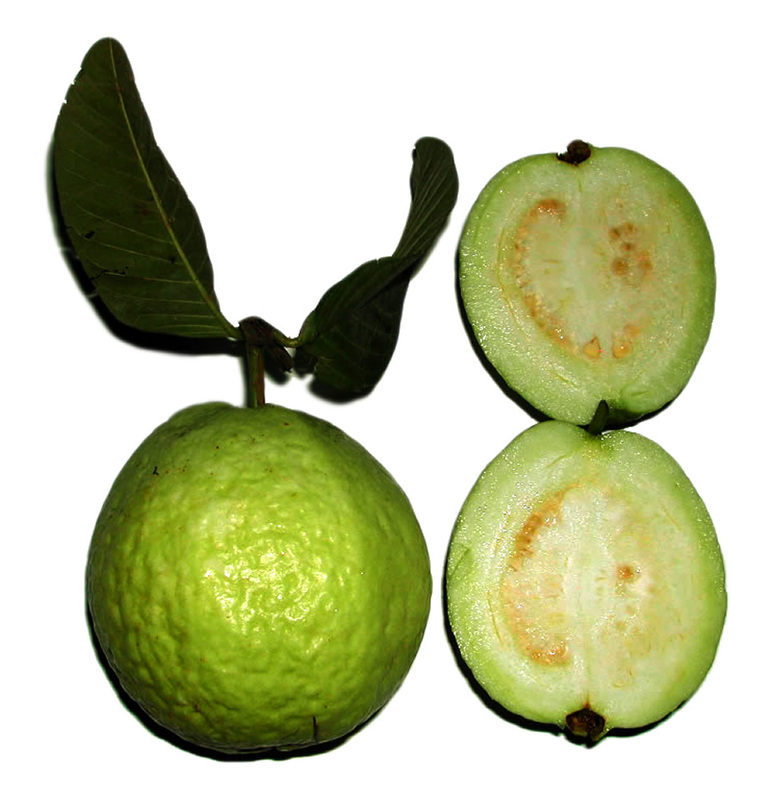 Soil: Psidium guajava can be cultivated on varied types of soils from heavy clay to very light sandy soils. 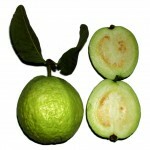 Nevertheless, very good quality guavas are produced in river-basins. It tolerates a soil pH of 4.5 to 8.2. Maximum concentration of its feeding roots is available up to 25cm (10 inch) soil depth. Thus the top soil should be quite rich to provide enough nutrients for accelerating new growth which bears fruits. Good drainage is recommended, but Psidium guajava are seen growing spontaneously on land with a high water table–too wet for most other fruit trees. Irrigation: Water well from flowering to harvest. Exposure to drought conditions will delay flowering or cause the fruit to drop prematurely. Water it regularly and deeply for the best fruit quality. The Psidium guajava requires an annual rainfall between 1000 and 2000 mm (40-80 inch). It is salt-tolerant to a certain degree. It is drought resistant at the expense of fruit production. Fertiliser: Feed the tree every other month during warm weather. Use a fertilizer containing copper and zinc for at least one feeding per year. Otherwise, any complete fertilizer will do. Propagation: Propagation is by seed. Cuttings and grafting are more commonly used as a propagation method in commercial groves. Psidium guajava seeds remain viable for many months. They often germinate in 2 to 3 weeks but may take as long as 8 weeks. Pre-treatment with sulphuric acid or boiling for 5 minutes or soaking for 2 weeks, will hasten germination. Seedlings are transplanted when 5 to 75cm (2-30 inch) high and set out in the field when 1 or 2 years old. Seedlings will bear within 4 years. Because Psidium guajava trees cannot be depended upon to come true from seed, vegetative propagation is widely practiced. Pieces of any roots except the smallest and the very large, cut into 12 to 20 cm (5 to 10 inch) lengths, are placed flat in a prepared bed and covered with 5 to 10cm (2-4 inch) of soil which must be kept moist. Alternatively, cut through roots in the ground 0.5 to 1m (2-3 feet) away from the tree trunk; the cut ends will sprout and can be dug up and transplanted. Air-layers method is done by allowing the selected clones to grow for 3 to 5 years. Then a ring of bark is removed from each new shoot; root-inducing chemical is applied. Ten days later, the shoots are banked with soil to a height 10 to 12cm (4-5 inch) above the ring. After 2 months, the shoots are separated and planted out. Pruned branches may serve as propagating material. Cuttings of half-ripened wood, 6 to 12mm (1/4-1/2 inch) thick will root with bottom heat or rooting-hormone treatment. Using both, 87% success has been achieved. Treated softwood cuttings will also root well in intermittent mist. Softwood treated cuttings should root in 18 days in conditions of shade and high humidity (mist-spray the plants 2 or 3 times daily). 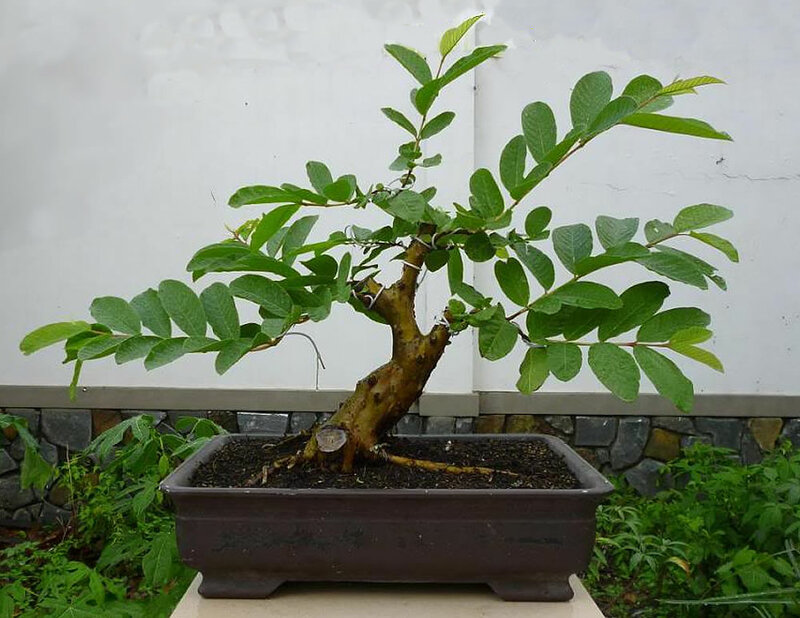 Under tropical conditions (high heat and high humidity), mature wood 2 to 3cm (3/4-1 inch) thick and 45 to 60cm (18-24 inch) long, stuck into 30cm (12 inch) high containers filled with soil, readily roots without chemical treatment. Approach grafting yields 85 to 95% success. Trials have been made of the shield, patch and Forkert methods of budding. The latter always gives the best results (88 to 100%). Vigorous seedlings 1.5 to 2.5cm (0.5-1 inch) thick are used as rootstocks. The bark should slip easily to facilitate insertion of the bud, which is then tightly bound in place with a plastic strip and the rootstock is beheaded, leaving only 6 to 8 leaves above the bud. About a month later, an incision is made halfway through 5 to 8cm (2-3 inch) above the bud and the plant is bent over to force the bud to grow. When the bud has put up several centimetres of growth, the top of the rootstock is cut off immediately above the bud. Sprouting of the bud is expedited in the rainy season. Lifespan: Psidium guajava live 30 to 40 years but productivity declines after the 15th year. Orchards may be rejuvenated by drastic pruning. Problem: Insect pests are numerous and in some cases severe. Avoid planting trees in soil known to be infested with nematodes. White fly and fruit fly may be a problem in some areas. In rainy years, fungal disease may become a problem. Psidium guajava are seriously damaged by the citrus flat mite (Brevipa1pus californicus) in Egypt. In India, the tree is attacked by 80 insect species, including 3 bark-eating caterpillars (Indarbella spp.) and the guava scale, but this and other scale insects are generally kept under control by their natural enemies. The green shield scale (Pulvinaria psidii) requires chemical measures in Florida, as does the guava white fly (Trialeurodes floridensis) and a weevil (Anthonomus irroratus) which bores holes in the newly forming fruits. The red-banded thrips feed on leaves and the fruit surface. In India, cockchafer beetles feed on the leaves at the end of the rainy season and their grubs, hatched in the soil, attack the roots. 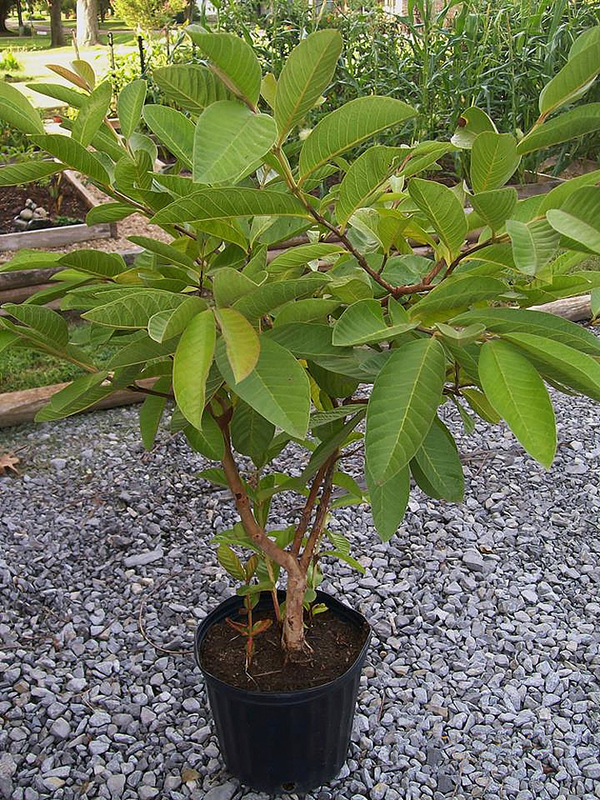 The larvae of the guava shoot borer penetrates the tender twigs, killing the shoots. Sometimes aphids are prevalent, sucking the sap from the underside of the leaves of new shoots and excreting honeydew on which sooty mold develops. The guava fruit worm (Argyresthia eugeniella) invisibly infiltrates hard green fruits and the citron plant bug (Theognis gonagia), the yellow beetle (Costalimaita ferruginea) and the fruit-sucking bug (Helopeltis antonii) feed on ripe fruits. A false spider mite (Brevipalpus phoenicis) causes surface russting beginning when the fruits are half-grown. Fruit russeting and defoliation result also from infestations of red-banded thrips (Selenothrips rubrocinctus). The coconut mealybug (Pseudococcus nipae) has been a serious problem in Puerto Rico but has been effectively combatted by the introduction of its parasitic enemy, Pseudaphycus utilis. Soil-inhabiting white grubs require plowing-in of an approved and effective pesticide during field preparation in Puerto Rico. There are other minor pests, but the great problems wherever the Psidium guajava tree is grown are fruit flies. The Psidium guajava is a prime host of the Mediterranean (Ceratitis capitata), Oriental (Bactrocera dorsalis or Dacus dorsalis), Mexican (Anastrepha ludens) and Caribbean (Anastrepha suspensa) fruit flies and the melon fly (Dacus cucurbitae). Ripe fruits will be found infested with the larvae and totally unusable except as feed for cattle and swine. To avoid fruit fly damage, fruits must be picked before full maturity and this requires harvesting at least 3 times a week. In Brazil, choice, undamaged guavas are produced by covering the fruits with paper sacks when young (the size of an olive). Infested fruits should be burned or otherwise destroyed. In recent years, in Florida have been introduced wasps that attack the larvae and pupae of the Caribbean fruit fly and have somewhat reduced the menace. In Puerto Rico, up to 50% of the guava crop (mainly from wild trees) may be ruined by the uncontrollable fungus (Glomerella cingulate) which mummifies and blackens immature fruits and rots mature fruits. Diplodia natalensis may similarly affect 40% of the crop on some trees in South India. Fruits punctured by insects are subject to mucor rot (caused by the fungus, Mucor hiemalis) in Hawaii. On some trees, 80% of the mature green fruits may be ruined. Algal spotting of leaves and fruits (caused by Cephaleuros virescens) occurs in some cultivars in humid southern Florida but can be controlled with copper fungicides. During the rainy season in India and Cuba, the fungus Phytophthora parasitica is responsible for much infectious fruit rot. Botryodiplodia sp. and Dothiorella sp. cause stem-end rot in fruits damaged during harvesting. Macrophomina sp. has been linked to fruit rot in Venezuela and Gliocladium roseum has been identified on rotting fruits on the market in India. In Bahia, Brazil, severe deficiency symptoms of Psidium guajava was attributed to nematodes and nematicide treatment of the soil in a circle 1m (3 feet) out from the base restored the trees to normal in 5 months. 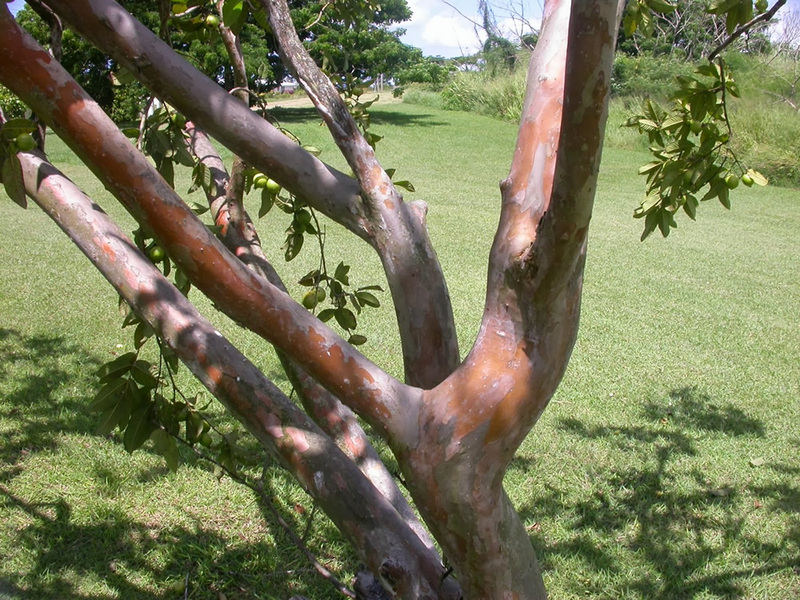 Zinc deficiency may be conspicuous when the Psidium guajava tree is grown on light soils. It is corrected by two summer sprayings 60 days apart with zinc sulphate. Wilt, associated with the fungi Fusarium solani and Macrophomina phaseoli, brings about gradual decline and death of undernourished 1 to 5 year old Psidium guajavatrees in West Bengal. 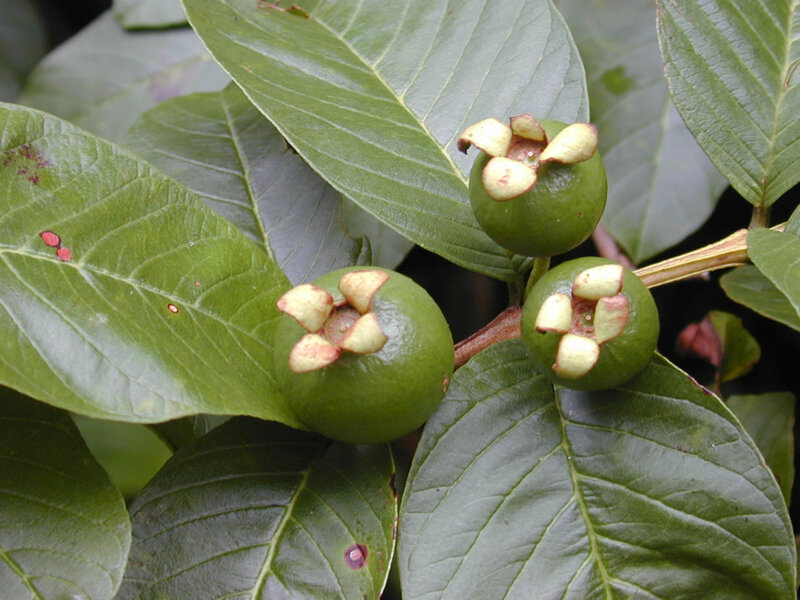 A wilt disease brought about by the wound parasite (Myxosporium psidii) causes the death of many Psidium guajava trees, especially in summer, throughout Taiwan. Wilt is also caused by Fusarium oxysporum f. psidii which invades the trunk and roots through tunnels bored by the larvae of Coelosterna beetles. Anthracnose (Colletotrichum gloeosporioides) may attack the fruits in the rainy season. Pestalotia psidii sometimes causes canker on green guavas in India and rots fruits in storage. Severe losses are occasioned in India by birds and bats and some efforts are made to protect the crop by nets or noisemakers. Uses and display: In addition to being eaten fresh, the fruit of Psidium guajava is great for jams and stewing. Also, it is ideal juice as fruit is high in Vitamin C.
The medicinal uses of the Psidium guajava are many and varied. Tea made from the leaves and/or bark is known to help cure diarrhea and dysentery, as well as treat stomach upsets, vertigo and regulate menstrual periods. Trees serve as shade/shelter for livestock and are used for erosion control. When parasitised by the mistletoe ( Psittacanthus calyculatus ), the Psidium guajava tree produces rosette-like malformations known as ‘wood flowers’. These are sold as ornamental curiosities. 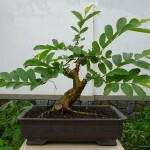 Psidium guajava is also becoming a popular bonsai species.